Let’s be honest: Most event reports sound kind of the same. At least they always start very similar: the event took place for the umpteenth time, a lot of tickets were sold and after several days full of sessions, workshops and panel discussions, everyone came together for the closing-slash-networking-party to celebrate the event’s success and make plans for the next time. Overall, this year’s MozFest at London’s Ravensbourne College wasn’t completely different from that. And yet a recap according to the book just wouldn’t feel right for Mozilla’s annual festival – because it’s simply a little bit different from most other conferences. Maybe that’s because of its personal atmosphere. Or because a lot of the wrangling is taken care of by incredibly committed volunteers. Or it’s because the most diverse people come together at MozFest to explore how we can make the web better for everyone. But no matter what it actually is that makes MozFest so special: What begins with what may be the first rap that contains the word ‘innovation’ simply cannot end with run-of-the-mill. That’s why we’re letting seven of our dearest colleagues speak instead. My first MozFest. I had already heard so much about it and was full of anticipation while traveling to London. Nevertheless, MozFest exceeded all my expectations. We live in a time when you sometimes just want to bury your head in the sand after reading the morning news. That’s precisely why the people at MozFest, their inspiring work and goals reminded me that being hopeful is worth it. For example, you may sit in a session with Jon Rogers and Julia Kloiber, both of them Mozilla Fellows, and collectively imagine a future you would like to live in – and then trace back, step by step, what would actually have to happen so that this future could become reality. And you realize that it’s maybe not a complete illusion – or at least it doesn’t have to remain one. It’s doable. If we work on it together and perhaps take an extra step from time to time. This year MozFest celebrated its ninth birthday. Since the first issue it has grown quite visibly, but the spirit has remained the same: You feel surrounded by a stunning drive, by visionary concepts, but also by a clear view of the world that is not concealed by rose-colored glasses. Especially not nowadays, when even users who are otherwise hardly concerned with data protection, online security and the future of the web realize that we’ve arrived at a proverbial junction for the future of the web. The change of MozFest themes over time reflects that – not only in the sessions, but also in the Speaker Series. The MozFest 2018 speaker series was our most dynamic one yet. There were seven solo talks and four panels, exploring topics like AI’s Collateral Damage and Data in Oppressive Regimes. Participants included privacy researchers, a former FBI special agent, misinformation experts, and the inventor of the World Wide Web. The talks and panels that unfolded across the weekend inspired participants to write code, swap ideas, and launch campaigns to make the internet a healthier place. Of course, sitting still and just quietly listening to lectures and talks all day is not was MozFest is all about. That’s why visitors were also able to take part in over 320 workshops, sessions and other formats at this year’s event, where they could contribute brainstorms and share their knowledge. It was the first time for me to attend MozFest, after I heard only good things about it from last year. When I walked into the venue on Saturday morning, I immediately knew that this conference was a bit different than others I attended: Spread over 9 floors, separated into different topic areas people from all sorts of backgrounds presented their work, project & ideas. Fully unprepared and a bit overwhelmed I jumped into sessions discussing interplanetary communication tools, data journalism using satellite imagery or how and if we should preserve all digital content as historic artifacts in an ever-changing world. The one thing I enjoyed in all these sessions: Technology by itself was not considered as the solution to problems. It might inform what solutions we built, what features we add or what data we track, but we also need to be critical of its implementations. I definitely want to come back next year. Even though MozFest is all about tech, about technological solutions, approaches and yes, also about tech-related challenges, the thematic spectrum this year was broader than ever – which is not a big surprise after all, given that technology has become an essential part of our everyday lives, which can no longer be split into purely digital and clearly analogue. Sometimes, this leads to new ethical questions. And we were happy to discuss these at MozFest, as well. Over the course of the last days a lot of people asked me what MozFest was like, what I experienced and what my personal highlights were. And there’s no easy answer, given the over 300 sessions! The intro of MysDiggi was of course great and listening to Mitchell Baker and Mark Surman talking about Mozilla and the MozFest was very inspiring. But what also found extremely interesting were the sessions around Consent Management: See, we all feel that something about the WebAd system is not quite right. As users we might even find it kind of creepy to be followed by trackers, which collect information about us, pass it on to others and create complete digital profiles of us. It is just too much. That’s why more and more people use tracking protection. And so this aggressive ad system ultimately hurts publishers who rely on advertising revenue, because fewer ads are displayed to actual users, which basically invites ad fraud through bots, which then reduces the value of the publishers’ ad space. There’s a huge discussion going on around this at the moment; however, the solution could be quite simple: For advertisers and publishers, rebuilding user trust should be a top priority because it would increase the consumer’s willingness to share data consciously and support publishers they like. My colleague Don Marti talked about that and his Global Consent Manager project at MozFest. The Global Consent Manager project, sponsored by the Reynolds Journalism Institute, is a browser extension to help users manage their privacy preferences. The extension uses an existing open-source, standard format, called a consent string (invented by IAB Europe), which is machine readable by collaborating websites or publishers. And here’s how the extension works: Since the GDPR came into place in May 2018, a pop-up will ask you to accept cookies whenever you visit a website for the first time. If you click ‘ok’, trackers will follow you around while you’re on this website and even beyond if you accept cookies on the next pages you visit, as well. With the Global Consent Manager extension, when you visit a website for the first time, you’ll not see the pop-up because Global Consent Manager generates a temporary consent string indicating “no consent”. Because this is all about trust. When you show that you trust the website, e.g. by visiting it repeatedly, the extension will delete the temporary consent string and enable you to easily manage your consent. Our first set of user research data shows significantly more engagement. This project is part of a bigger effort to collaborate with publishers, brands and agencies on our Enhanced Tracking Protection work at Mozilla. The angle that makes our work different from all the other attempts to reinvent web advertising is that we are not building a single choke point like a whitelisting program or new cryptocurrency, but are instead building the tools (in browser and on the server side) to help people share their information when they want to but not share it when they don't – which leads to an advantage for sites that people choose to trust. As part of my open leadership training, I am exploring the question of alternative funding and decision making structures in tech companies that go beyond the traditional model (and pressure) of VC funding. In my Mozfest session, I wanted to involve the participants in discussions on how to maximize the profits for an incentive to align company decision with its original mission and values. Not only because it is the right thing to do but because it aligns with their funding and business model. We talked about the existing models like steward ownership or platform cooperative but we also worked on concrete business canvas to experiment with new ideas. I was very positively surprised by the number of people who showed up for my session. I think it clearly showed a big need for discussion on how we can concretely start changing the current broken online economy system so that it finally starts benefiting our societies instead of just a few investors. Doing things differently – yes, that’s not just a motto for MozFest, but was also the approach for this little racap. And yet we come to the one point that somehow never fails to appear: Space and time for this blog post simply don’t allow for covering the whole spectrum of the conference. There were sessions in which lost Tudor treasures were rediscovered using A-Frame, brainstorms around the ideal queer dating app or the decentralization of machine learning. And in addition to all that, there was also MozFest House, which opened its doors the week before MozFest, because: sometimes a weekend just isn’t enough! Among my favorite sessions were Misinfocon at Mozfest House the week before the weekend, as well as a full day’s conversations with BBC’s Research & Development team about how to build “a public service internet”. I learned what city government officials are doing to make the internet healthier for citizens, and how Ranking Digital Rights is thinking about how to expand their Corporate Responsibility Index. 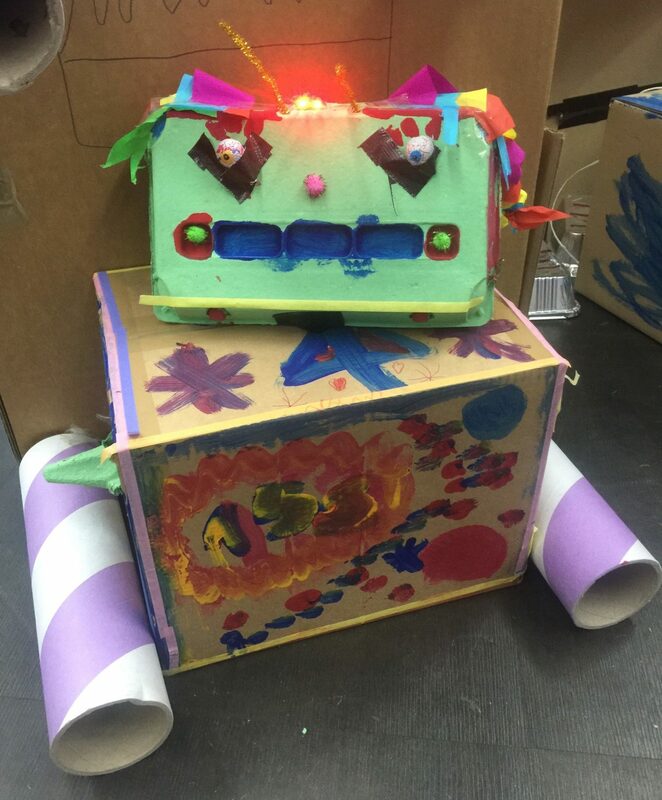 My daughter joined me for the weekend and greatly enjoyed the kid’s makerspace in the Youth Zone where she built a cardboard robot and saw many other cool things. This year’s MozFest week and its many side events was definitely one of my favourites: it was buzzing, informative, thought provoking, community focused, fun – and wonderfully colourful. In fact, I found myself so caught up in real-life interactions, I barely got to look at my phone for sharing, commenting, capturing, analysing – disconnecting in the most enriching ways. My personal highlight was being able to host the screening of the award-winning documentary ‘The Cleaners’ – not least since the following Q&A still has me thinking about potential future topics the directors could investigate and visualise.